A ceiling can be a real pain in the neck to paint, but there are some simple ways to make this job a bit easier. The key to success is called cutting in—paint the edges of the ceiling with a brush first to get good coverage on that first inch or two from the walls. Use a high-quality two-inch angled sash brush to apply paint all around the perimeter of the room, in a neat, straight line right up to the walls. Allow the cut-in areas to dry. Then take out your roller and extension pole and start filling in the middle. Work from one side to the other, starting from the side where you started cutting in. 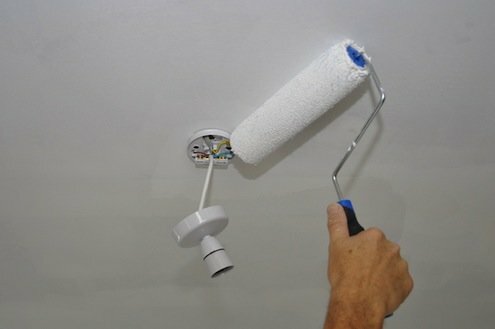 Roll over the areas you painted with a brush, getting as close as you can to the walls without hitting them with the roller. Stop every so often to look at your painted area from different angles, checking for missed spots—roll over them right away to keep coverage uniform. If you need a second coat, be sure to cut in again—it’s worth the effort to get good coverage.